In Part 1, we did a style makeover of a 1998 Fender MIM (Made In Mexico) Stratocaster, exchanging the original white pickguard, trem plate, pickup covers, and knobs for all new parts - a Fender tortoise pickguard, Allparts "vintage cream" pickup covers and knobs, and an Allparts tortoise pattern tremolo cover. This time, we'll perform a very basic bridge and neck setup, for a couple of reasons. First, this Strat has been without strings for a while since the plastic bits were replaced, and after new strings are put on, the neck might need a bit of tweaking. This particular guitar played well enough before we started the makeover project, so only minor adjustments, if any, would be needed. 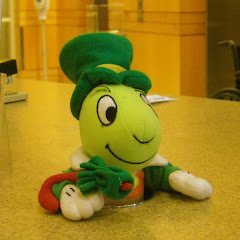 If it had any real issues, the setup needed would be beyond the scope of this blog post. Secondly, we're going to go with a different bridge setup, with the top plate flat against the body instead of the previous floating tremolo. This Strat is going to be a birthday gift for a 16 year old who hasn't owned a guitar yet, and whatever we can do to reduce the usual Stratocaster tuning instability drama, will be a good thing. Of course, we could insert and glue two pieces of wood in the trem cavity to hold the inertia block rigidly in place, but having a non-floating plate, along with four springs all pulled up tight, is quick and easily reversible, and the guitar still has that "sproingy" trem bridge Strat sound. And yeah, some people hate that springy trem tone, but then again some people have sad, ungraceful lives. 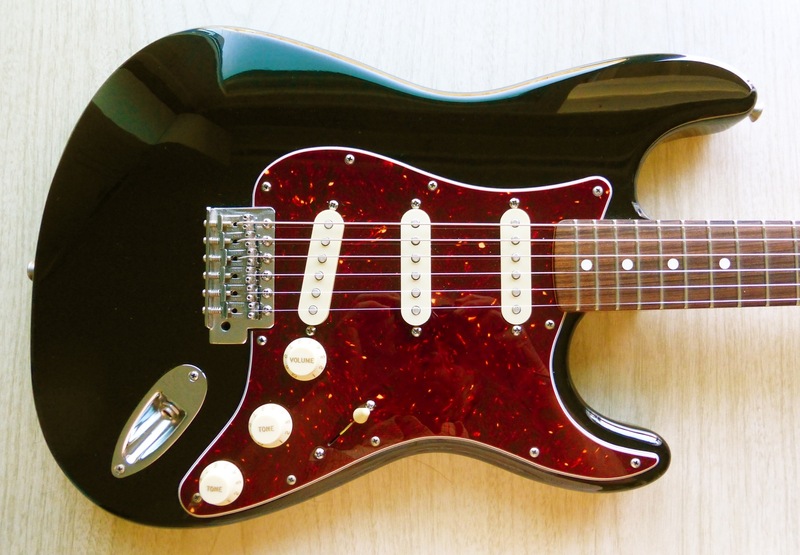 Why have a Stratocaster if you don't like its characteristic tone? On my own Strat, I prefer a floating trem, even though I never use a whammy bar; often, I'll press down on the bridge while playing to add a bit of vibrato, and it's fun to pull up on the back side of the trem plate sometimes to make dive-bombey notes and chords. For someone just starting out on guitar, it's probably better to have the added tuning stability of a non-floating bridge. I usually set the action on most of my electric guitars to 1/16" above the 12th fret on the high E string, and somewhere between 5/64" and 3/32" at the low E. Checking at the 12th fret is a habit left from playing acoustic guitar; Fender suggests checking at the 17th fret, with slightly higher height measurements. 1/16" at the 12th works for me, but not everyone has the same action preferences, so adjust as needed to suit yourself. Just set the heights approximately at this point - it will probably have to be done again later after the other setup adjustments are completed. When the saddles are raised, the string tension will increase and they will rise in pitch somewhat, so re-tune again. 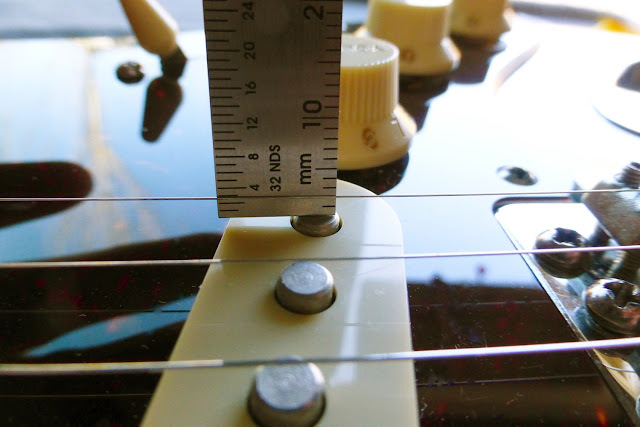 Now is a good time to check the alignment of the strings relative to the fingerboard and the pickups. 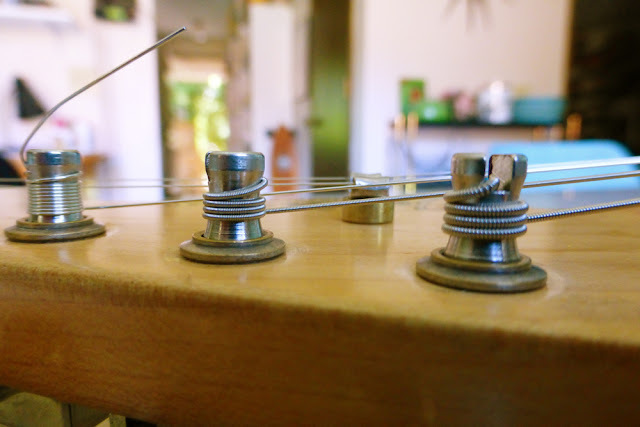 With all strings at full tension, loosen all four neck bolts slightly, but not very much - just enough to be able to move the neck in the neck pocket. The first time you do this, it may take a couple of tries to get just the right amount of looseness, but it's really not difficult. Next, pull the neck sideways until the strings are aligned to your satisfaction, and then tighten up the neck screws again. That's it! Simple, done! * Note: I've had a couple "experts" tell me that the above method is somehow wrong, but - if this is how it was done at Leo's factories, but now it's suddenly incorrect in the 21st century, then WTF, you know? Now let's make sure the neck has the correct amount of relief, which is a small amount of bow that can help minimize string buzz. 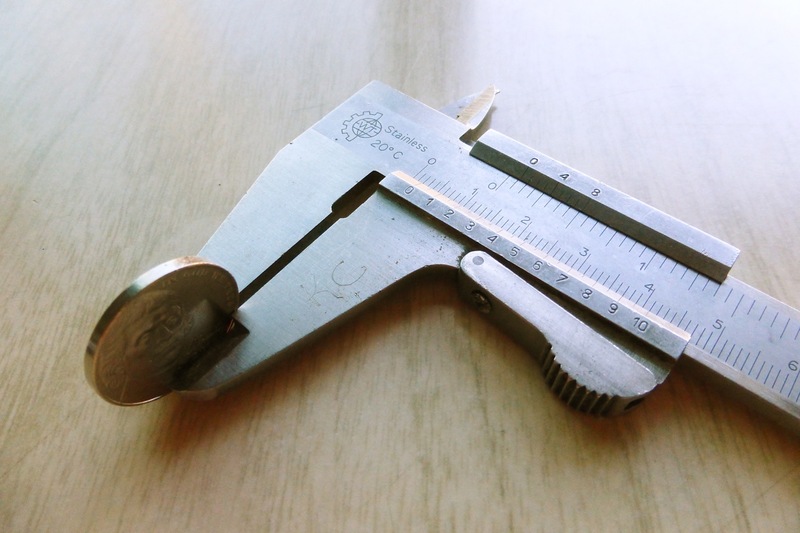 You can use a precision straight edge and a set of high quality feeler gauges to check the fingerboard relief, but there's another (cheaper) way that's usually good enough. Let's assume that new strings tuned up to full tension are as good and straight as a well made ruler. Fret any string (I usually use the D string) at the first fret, while at the same time fretting that string with your other hand, at the last fret, and check how much space there is between the top of the 8th fret, and the bottom of the string. Just a small amount of space seems to be correct - if you can see air under the string while checking it, great. Fender suggests checking on the low E string, placing a capo on the first fret while fretting at the last, and using a .010" feeler gauge. 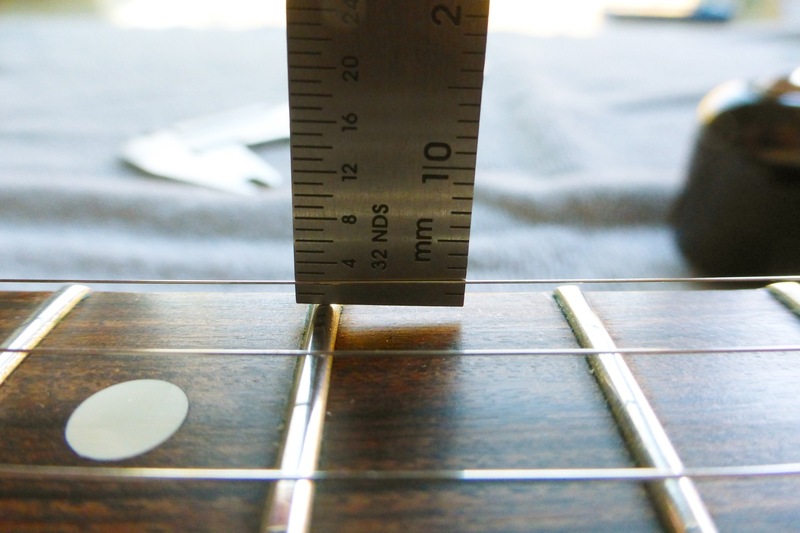 .010" is 1/100 of an inch, the same size as the diameter of most electric guitar high E strings, and that's a very small, but still visible gap between the fret and the string. I like to check relief on each string, and average out the differences. In this case, there was too little relief - the strings were laying on top of the 8th fret - so we needed to back off on the truss rod adjustment nut and reintroduce some relief. 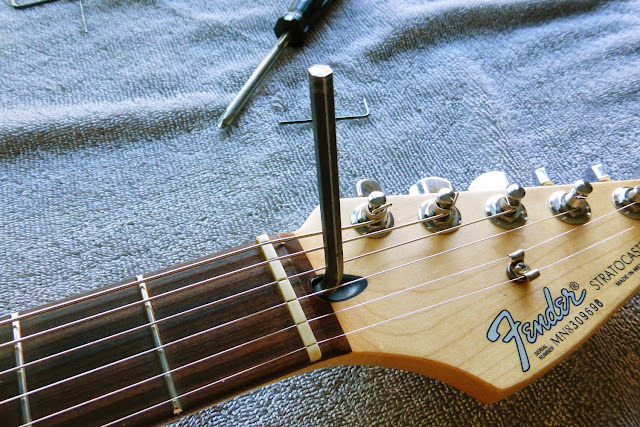 When doing any truss rod adjustment, it's best to be cautious, and take your time doing it. Turn the wrench (or large flat-blade screwdriver in some cases) slowly, don't yank it, and only 1/4 turn at a time. To correct too much bow, turn the truss rod nut clockwise (tighten); to get more fingerboard relief, turn it counter-clockwise (loosen). Only do a 1/4 turn in either direction, and wait a day to see how the neck has taken the adjustment before doing another 1/4 turn. 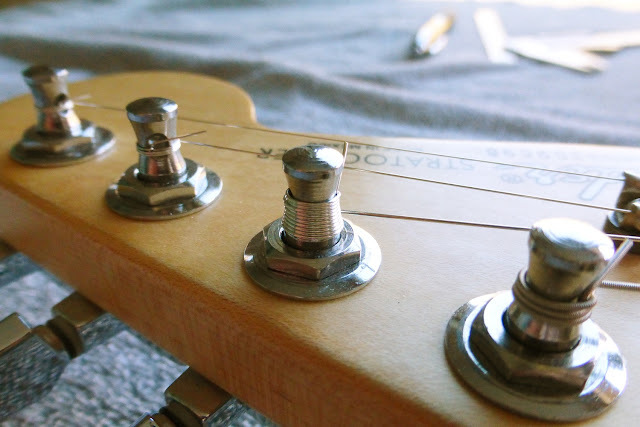 Usually, backing off on the adjustment nut yields quicker results than tightening the nut, but it's always best to give the neck enough time to settle in. This time, only one adjustment was necessary to get a nice amount of relief. Afterwards the action (string heights) was checked again and the saddle heights readjusted. 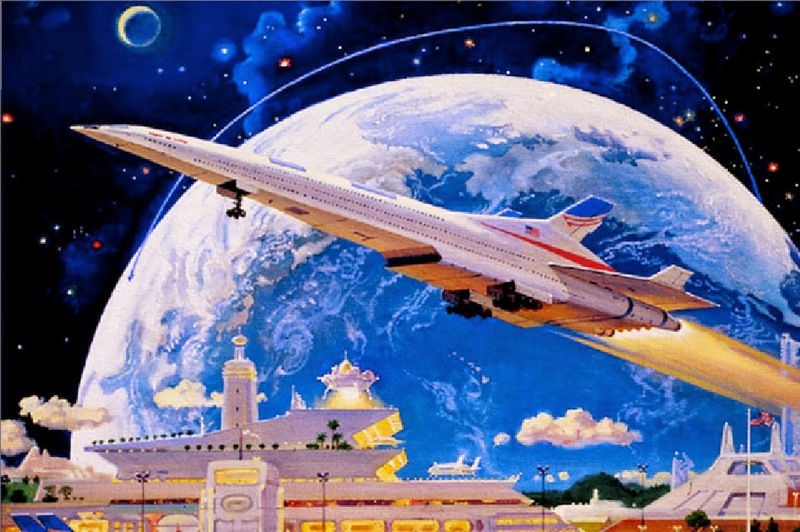 If we're lucky, we won't have to set the action again. 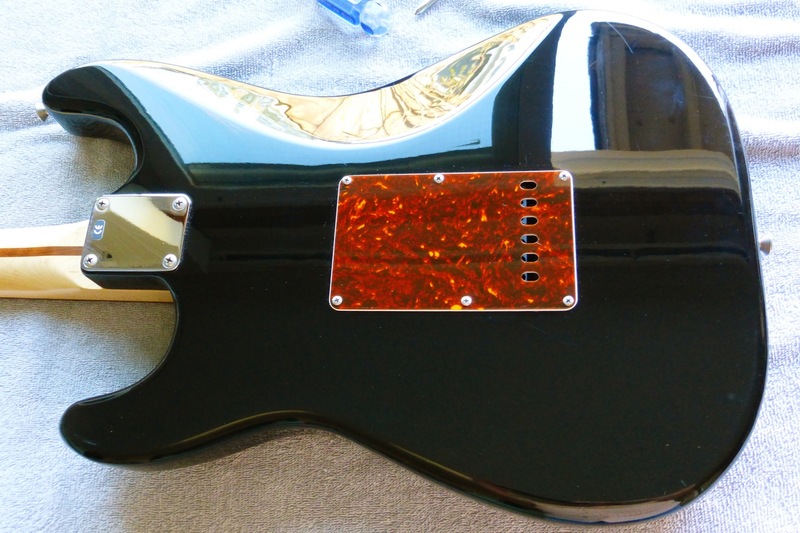 Next, let's adjust the heights of the pickups. 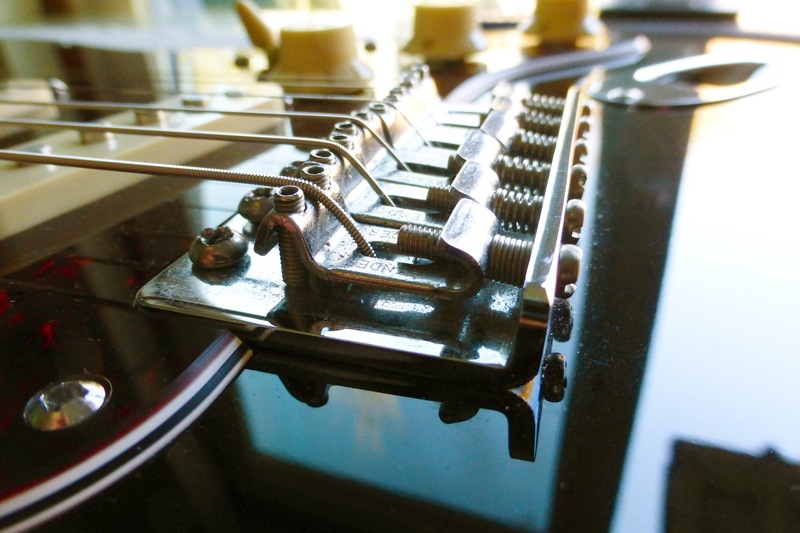 The old classic method from the dawn of the electric guitar era was to take a US nickel 5 cent piece, place it between the high E string and its pole piece on the bridge pickup, and, while fretting that string on the last (21st) fret, adjust the pickup up or down until the nickel barely fits. 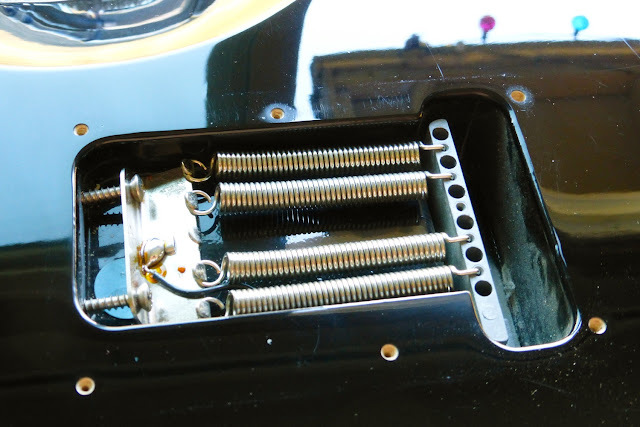 Next, adjust the low side of the bridge pickup until both E strings are about the same in volume (or to taste), and then, adjust the neck pickup (of a Tele, or the other two pickups of a Strat), until all of the pickups have similar output, and you're done. However, doing all that is fairly labor intensive, but there is a pickup height setting procedure that yields a tonal result that gets you 90% of the way there, in a lot less time: the metric method. It's a great starting point, and often, no further adjustment is needed. Plug in, play, and check how it sounds in all switch positions - good? Great, almost done. Not good? Then adjust to suit your own ears. 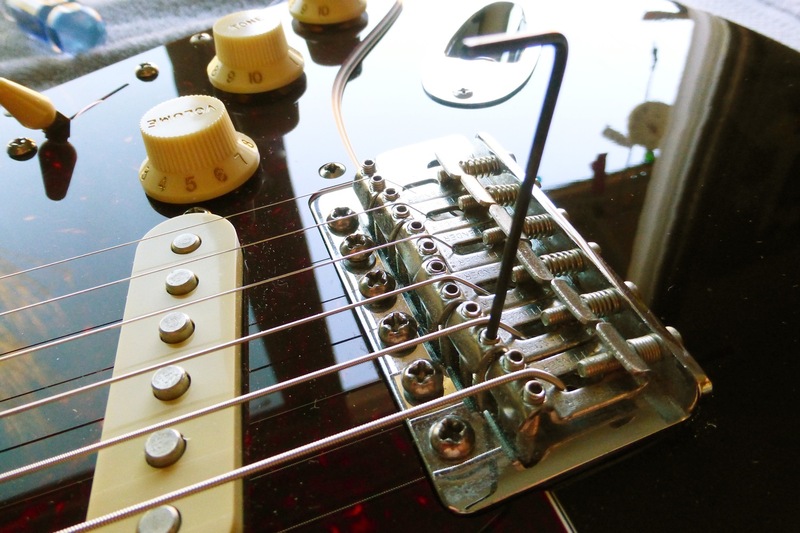 "Set the pickup switch to the Neck position. Set the volume and tone controls to maximum and tune the guitar. Check the intonation of each string with an electronic tuner by playing the open string harmonic at the 12th fret and comparing this note with the note produced by fretting the string at the 12th fret. The pitch should be the same + or - 1 cent (1/100th of a semitone). 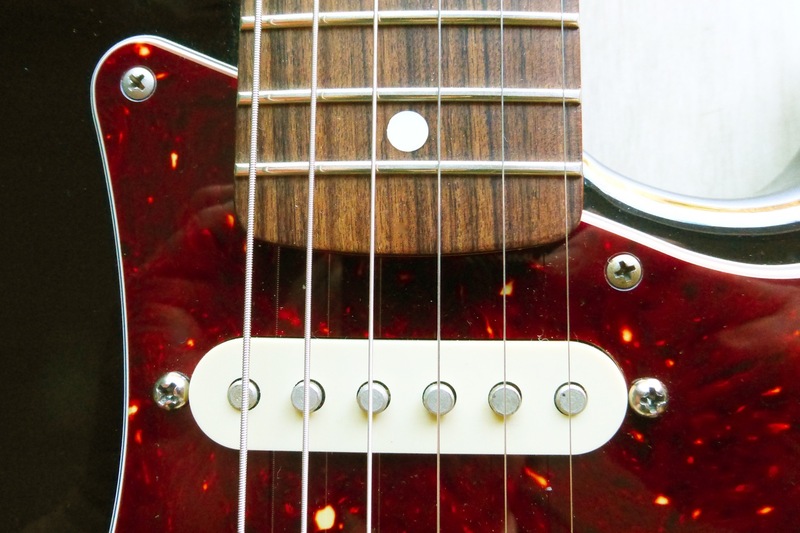 If the fretted note is sharp, the string must be lengthened by moving the saddle back; if the fretted note is flat the string must be shortened by moving the saddle forward. Turn the phillips screw on the end of the bridge clockwise to lengthen or counterclockwise to shorten. After each adjustment, retune and repeat this test until both notes produce the same pitch." 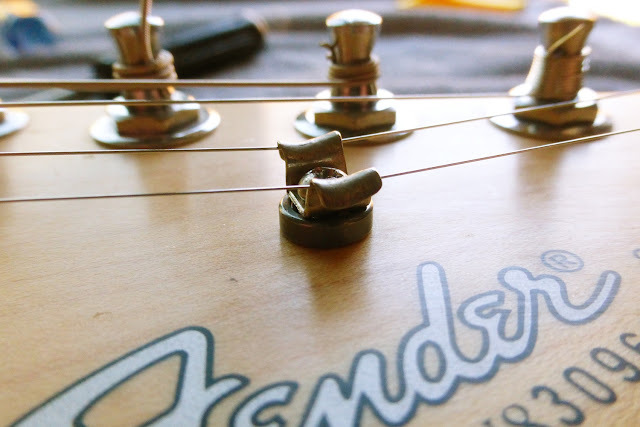 I'll add one thing to Fender's instructions: it's difficult or impossible to correctly do an intonation adjustment with old, worn strings, since the reason why old strings sound all wonky is due to whacked out harmonic content caused by irregular string vibration. Put on a new set first, make sure the windings are well seated at the tuning posts, re-tune, and then check and adjust. Sure, there's a couple scratches on the black finish, but that's a really nice shiny 18 year old Fender. 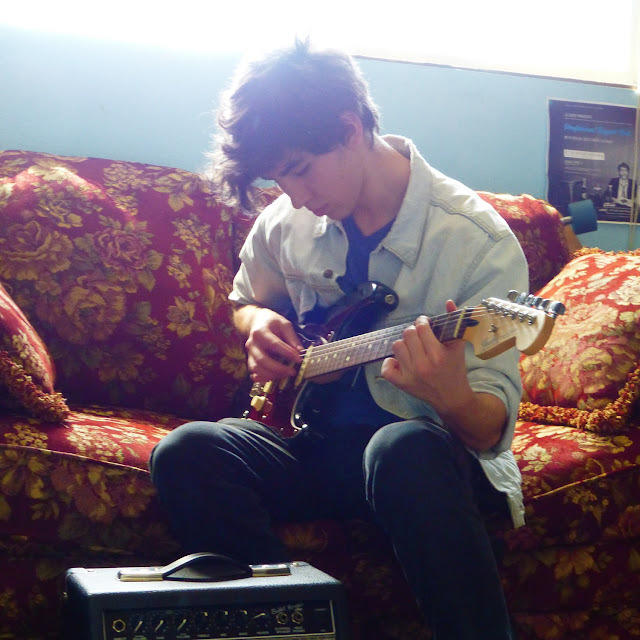 That's it, we're done with a very basic Strat setup, and it's ready to rock out with. I have no doubt that a real professional guitar tech could do a better job of it overall, but - I'm just a home handyman and Neanderthal shade-tree mechanic kind of guy, and limited to what tools I have on hand in my cave, uh, garage workshop. Luckily, the methods I've used seem to work well, or well enough for rock and roll. The point is, if I can set up a Fender style guitar so that it plays well and sounds good, literally anyone else can, too. 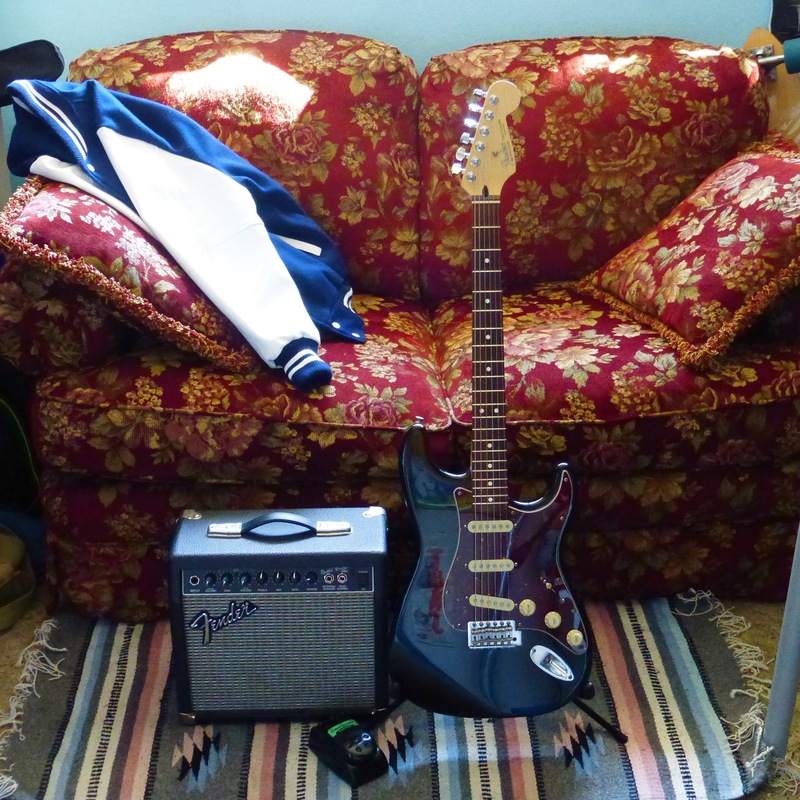 Besides the shiny "Black Tortoise" Strat, there's a made in USA Fender Bullet practice amp, and a TS-808 modded '90s Ibanez TS-5 Tube Screamer. Happy Birthday!